I began the day with a delicious breakfast free from both sugar and dairy. 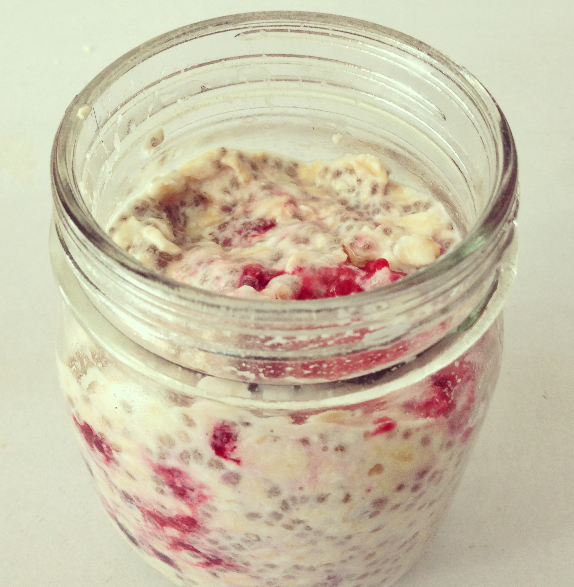 I made a less luxurious version of the bircher muesli recipe from the My New Roots blog. This entry was posted in Uncategorized and tagged Bircher Muesli, Blueberries, breakfast, Chia Seeds, Dairy-free, healthy, My New Roots Blog, Raspberries, Sugar-Free. Bookmark the permalink. I’ve been making something similar to this with flax, steel cut oats, cacao powder, and sometimes nut butter! It’s so hearty and filling. Love that you added strawberries – makes it look like strawberry and cream!